At Notre Dame, retreats are an integral part of our Campus Ministry program. They provide opportunities for students to grow spiritually in a Christ-centered environment. The program encourages students to explore personal faith, build community, develop leadership skills and spend time in prayer. Each student is required to participate in an annual retreat. A student liturgy committee plans several school-wide liturgies throughout the year. The entire student body, faculty, and staff participate in liturgies marking Thanksgiving, Christmas, Lent, and Easter. Seniors and their parents are invited to a graduation liturgy which celebrates and welcomes them into the alumni family. The Notre Dame service requirement requires each student to complete approximately 50 hours of community service by graduation. The goal of this program is to deepen the students’ personal development through increasing self-awareness, nurturing self-actualization and confidence, and encouraging them to be responsible. 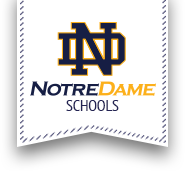 Notre Dame students completed 14,500 hours of community service during the 2017-2018 school year.